Trade verdict: How did your club fare? PORT Adelaide has shown interest in drafting the SANFL's leading goalkicker Brett Eddy as a rookie-listed mature-aged recruit. The 27-year-old has spoken with Power officials about a possible move to Alberton and joining an AFL list for the first time. Eddy is coming off an impressive season for South Adelaide where he booted 74 goals and was named in the SANFL's Team of the Year. The Power is after reinforcements in their forward line after delisting veteran Jay Schulz and former No.8 draft pick John Butcher. Standing 194cm, Eddy is versatile enough to play a variety of different roles in attack, whether it's deep inside the forward 50 or as a high half forward. Eddy has great hands, reads the play well and is a reliable set shot at goal. He has spent the past four seasons with South Adelaide and attracted interest from AFL clubs at the end of 2014. 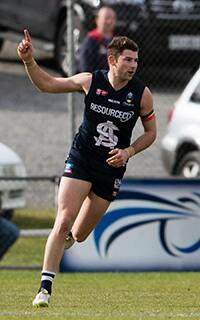 Eddy played for De La Salle in the VAFA before joining Collingwood's VFL team in 2011. He turned plenty of heads, booting 21 goals in eight games, before tearing the anterior cruciate ligament in his knee. Moving to South Adelaide in 2013, Eddy was the runner-up as the leading goal-kicker in the SANFL in 2014 and 2015 before going one better and winning his first Ken Farmer Medal this year. There is a Port Adelaide connection at South Adelaide, with coach Brad Gotch previously a senior assistant with the Power. Selecting Eddy in the rookie draft would be a low-risk, high-reward move by the Power in case injuries strike to key forwards Charlie Dixon and Justin Westhoff. The Power will have at least one rookie list spot free after midfielder Kane Mitchell was delisted. Fellow midfielder Will Snelling is likely to be promoted to the senior list.